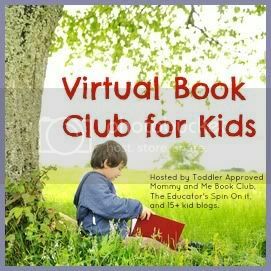 Welcome to the September edition of the Virtual Book Club for Kids! If you want more information on the VBC, check out my introductory post. Anyone is welcome to join us each month as we team up with a group of bloggers to study favorite authors. For the month of September, we are focusing on book activities to accompany books by Lois Ehlert. Lois Ehlert is one of our favorite authors. In the past, I've shared her books Growing Vegetable Soup, Planting a Rainbow, and Leaf Man. This month, I decided to choose the book "Nuts to You". This is a perfect book for the month of September. In our neck of the woods, there are squirrels everywhere. We basically live in the trees. Our house sits on the top of our wooded lot which drops down into a large forest. Squirrels scamper up the tree near our deck grabbing at our bird feeder and saying hello. We do more squirrel watching than bird watching! Nuts to You by Lois Ehlert provided the perfect time to talk about squirrel habits. We began by reading the book while we munched on this nutty snack. (I found this idea on Pinterest. Where else?) 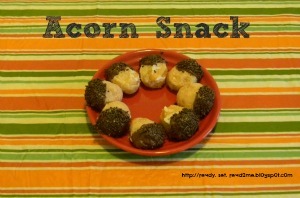 You can make these edible acorns by topping donut holes with nutella and covering with chocolate jimmies. After tasting a few "acorns", we tried painting with nuts. We dipped a variety of sizes of nuts into paint, placed them in shoe boxes with paper inside, and shook. We watched the squirrels outside to see if they could hear our nuts or maybe even smell them. One squirrel did stop by the back door! Finally, we took a walk through our neighborhood. We looked for squirrels and acorns. We found piles of cracked nuts on retaining walls and we guessed that squirrels had been there. 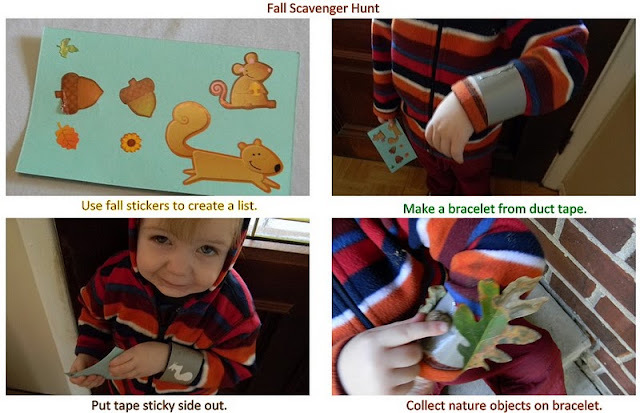 We even took our fall scavenger hunt cards along to see if we could find any other evidences of fall. (It's still a little early so we'll probably go out later in the season with these cards too). The boys found nuts and loudly yelled, "Nuts to you!" The neighbors now think know we are crazy. Nuts to You is written as a narrative story. At the end of the book, Lois Ehlert includes several expository paragraphs sharing facts about squirrels. This could provide older readers an opportunity to compare narrative and expository writing. They could even observe squirrels or another animal and create their own narratives and expository writings. I think this would make such a great mentor text! Loved to see your ideas for Nuts to You! We featured this book too. Thanks for the great ideas. So fun! I love the acorn shake painting! We're going to try acorn shaking- love this idea. I love your activities, especially the scavenger hunt! We just saw our first squirrel out today. So much fun! I miss my kids being little. You made this book come to life! I remember reading a blog called Happy Birthday Author. You should search for it. The blog covers many popular authors and shares some great info that is not always the most commonly known information about the authors. Nuts to You is a fun book - we read it last year. We like to watch squirrels in our backyard too. What a delicious snack! What a great way to explore a book!